Son La is a province, located in the North – West of Vietnam. The distance from Hanoi to Son La is about 286 km which takes you about 8 hours riding with amazing moutain view on it's way. Nowadays Son La with Moc Chau is becoming a highlight tourist place in Viet Nam which attracts many travellers from all over the world.Son La is an amazing place in the North - East of Vietnam. It has wonderful mountain, terraces view as well as rich culture of Ethnic people (Thai , Tay, Dao...). This is a must - see place for those who like to be in an untouristic place. - We have service to pick you up from your hotel or agency with English speaking guide. 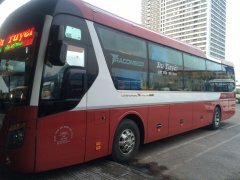 - We have contact with many good buses at the bus station, you will not have to worry about your belongings. - Easy to purchase ticket, you can book online 1 day, 2 days or longer in advance if you go on Vietnam holiday time. - We have worked with a lot of bus compaies the whole years, so we always have available seats for you even you go on our holiday as long as you let us know before 48 hours (on holiday time). - You can check all detail, useful information from our website: vietnamlocalbus.com before you decide to take your ticket. - We are free of charge you want to change departure date as long as we are informed 24 hours in advance by confirmation to you. Here is all information of our bus that you need to know. - 8:30 am : Our guide and car/ taxi picks you up at the hotel in the Hanoi Old Quarter then takes 30 minute to My Dinh bus station. At the bus station, you get the ticket and get on the big bus. It takes 6 hours to Son La city. On the way, we have 1 times for shortbreaks for bathroom. You also can find you some snacks for breakfast there on your own. 16:30: Arrived Son La city (last stop). Included: English speaking guide, car or taxi to bus station in Hanoi, bus ticket to Moc Chau. Excluded: Insurance, meals , drinks, tip to guide, personal expenses. 18.00 : Our guide and car/ taxi picks you up at the hotel in the Hanoi Old Quarter then takes 30 minute to My Dinh bus station. At the bus station, you get the ticket and get on the big bus. It takes 5 hours to Moc Chau city. On the way, we have 1 times for shortbreaks for bathroom. You also can find you some snacks for breakfast there on your own. 2:00 am: Arrived Son La city(last stop). Hanoi Oldquarter – My Dinh bus station – Ha Dong district – Hoa Binh city – Mai Chau village – Moc Chau Town – Son La bus station(last stop). 8.00 am, we pick you up at your hotel in center of Son La city to Hanoi. 15.30: Arrived My Dinh bus station (last stop). Included: Car or taxi pick up from your hotel, bus ticket to Hanoi. Excluded: Insurance, meals , drinks, tip to guide, personal expenses. Taxi to Hanoi old quarter. 22.30: we pick you up at your hotel in center of Moc Chau villages to Hanoi. 4.30 am: arrived My Dinh bus station (last stop). Hotel in Son La - Moc Chau - Mai Chau –Hoa Binh city – Ha Dong district - My Dinh bus station (last stop). Thanh Cong Taxi: 043257575, Mai Linh Taxi: 0438333333, Thanh Nga Taxi:0438215215. - Children under 4 years old sleep with their parents are free. 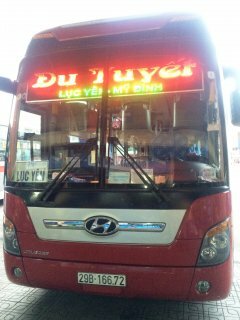 - Our bus stops at Son La city nearby there so many hotels we highy recomend Cong Doan hotel. You can rent motorbike in any travel agencies in Hanoi to slowly driving to Son La city then discovering all places in city and back . For a good quality for mountain roads motorbike, it costs about 8 USD per day which can be for 2 people sit on. You should drive slowly to enjoy landscapes and stop for photos shooting on the way. Therefore you should have a stop overnight somewhere on your way. Note: You should give your passport to agency, read the contact carefully and choose good motobike, furthermore you should check careful with their mechanic service conection in case your motobike is broken on the way. !!! Warning: You should be carefully before renting because roads to Son La are very dangerous with high passes, uphills way, specially in the dense fog. You can book and join a tourist bus from companies who organise tours to Son La but it really depends on your luck. Because tour from Hanoi to Son La only departure on a fixed day in month. Therefore, sometimes you can book - sometimes you can not. And it can be cancelled in a short advance when they cant collect enough customers to make their tour run. This option seems to be the most convenient one for you if you have a group of at leasts 3 - 4 people join with you. If not, it is kind of very expensive to go alone or too small group. You can take a taxi to My Dinh, Giap Bat, and Yen Nghia bus station to book ticket. Bus timetable is very flexible. Purchasing bus ticket by yourself, it means you have to arrange everything you do by yourself: taxis, contact driver, finding the right bus among hundreds buses in station... It is not very easy when you dont speak the language and local people here don’t speak English too. - At bus stations, there are many gangster men who are willing to cheat you to get you on a terrible or wrong bus, you have no idea where you are going to as you can not communicate to local people. Till you realise it, you are far away from the big city. - There are a lot of buses, neither do you know them, nor do they know you. If there is anything happens to your belongings, you have noone to ask for help. - During festivals time in Vietnam (Independence holiday, King ceremony holiday, New Year holiday...), local people often plan their holiday in advance. Bus tickets to Son La mostly fully booked very soon. Therefore it is difficult for you to purchase ticket by yourself if you have a narrow plan. - You should carry valuable things with you, incase your bags are picked up by other people by chance or by purpose. - Remembering plate number of the bus is always good incase you foget something on bus, we can find it quick & easy for you. - Before leaving the bus, you should check your belongings again and again incase it is picked up by othe passangers on bus before we find out. - At Son La, you can rent motobike to discovery everywhere about 10$ per day. If you want to carry motobike from Hanoi, we can only carry Honda Wave, Win motorbike, and you have to pay extra: 25$ per motobike.You shouldn't miss Son La prison, it is one of most famous prison in the North of Vietnam in the french colony. You can visit Son La all year but the best time to visit Son La is in April, May, June, August. Because it rains much during this time, the water from Dai Yem waterfall very strong. September, October are also a good season to have wonderful view of rice terraces around this area. 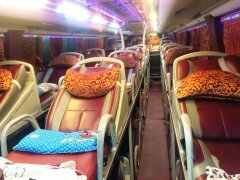 - Get discount 5% per person if you book on vietnamlocalbus.com group of 5 people.